How do you define a great picture ? Well, my definition is simple: you'll recognize a great picture when you see it. And that is what happened to me when Marion showed me some of her pictures of the old Alcatel-Lucent building ("Den Bell") in Antwerp. So I'm great that a few months later, this picture features on the cover of a great booklet by Linkeroever Uitgevers. I used to work in 'that' building - an old ITT building with a rich history, and for years and years the Belgian headquarters of Alcatel-Lucent (formerly Alcatel) in Antwerp. The headquarter building has now moved to "het Kievitplein", a modern office building. 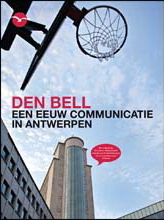 The booklet "Den Bell, een eeuw communicatie in Antwerpen" is created by Vooruitzicht (the developer of the site), Yellow Submarine (their comm agency) and Linkeroever Uitgevers - and has some great stories and pictures detailing the long and rich history of the site, the building, the people and the communication industry. And yes, I'm proud of Marion, who used to be a colleague when both of us were working in "Den Bell", who scored the cover picture for this booklet with the stunning view of the tower !